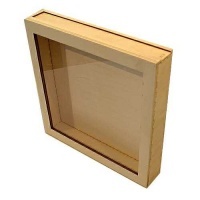 MDF slimline drop box frame comes ready assembled - just decorate and off you go! 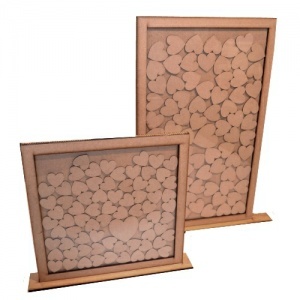 Supplied with a removable perspex window so you can decorate the internal back panel of the frame as well as the frame itself. 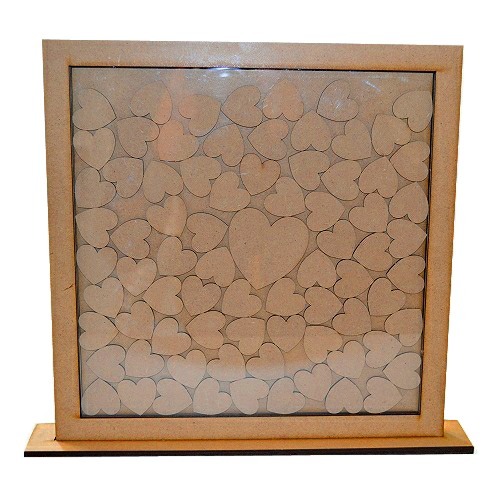 Frame comes ready drilled with a wall hanging hole on the back, or you can decorate the stand provided and glue the frame into this to display on a shelf, bookcase or other flat surface. 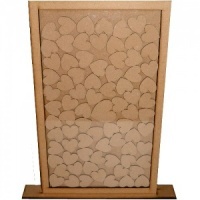 Drop box frames are extremely versatile - ideal for weddings, birthdays and special occasions for friends and family to write their names or a wee message on the hearts and drop into the frame through the slot provided. 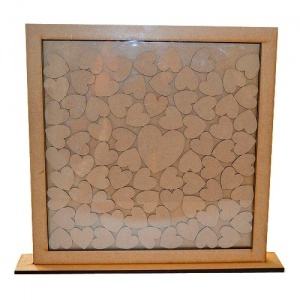 Create a beautiful piece of memorabilia to hang on a wall or mount on the stand provided. For best results when decorating we recommend acrylic paints and mediums such as DecoArt, and for a completely unique finished piece try decoupage, cover with pretty papers or even fabric. 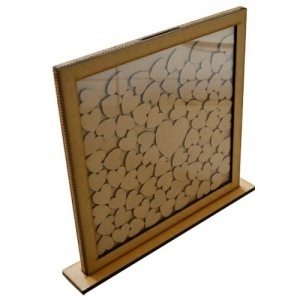 Extra perspex sheets are available (additional charge applies) - if you are using vinyl cut outs, this frame is specifically designed so you can swap the perspex sheet out for another design. NOT suitable for floating frames. Please order the total number of sheets you require (i.e if you order 1 box and want to create 3 different perspex designs, make sure you order 3 sheets). Perspex sheets come with a protective layer of film on each side - peel this off before use.